Polish President Aleksander Kwasniewski has criticised Germany for doing a deal with Russia to build a gas pipeline under the Baltic Sea, bypassing Poland. 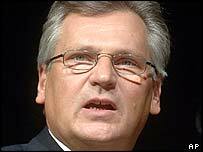 Mr Kwasniewski said the agreement was made without consulting Poland or the rest of the European Union. Warsaw is concerned that the pipeline could be used to divert energy away from Poland for political purposes. Since joining the EU last year, Poland has tried to persuade fellow members to adopt a common policy towards Russia. Mr Kwasniewski said it was unfortunate that Germany had decided to "go over the heads of Poland and the EU" and make its own decision. Like much of Europe, Poland is dependent on Russia for most of its oil and gas supplies. With relations between Moscow and Warsaw at their worst since the collapse of communism, many here believe Russia is punishing Poland for supporting Ukraine's Orange Revolution. Mr Kwasniewski prefers a scheme to build the pipeline over land - through the Baltic states and Poland - but his complaints appear to have come too late. The Russian President, Vladimir Putin, is expected in Berlin on Thursday to sign an agreement to build the Baltic pipeline with his German counterpart, Gerhard Schroeder.